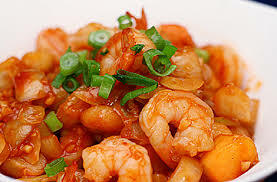 At first, shallow fry the prawns after marinating lightly with salt until prawns are lightly cooked - try not to overcook prawns as the rubbery texture of overcooked prawns are not very appetizing (to me!). The length of time it takes for the prawns to be cooked of course depends on the size of your prawns, but I always prefer mine especially for this step slightly under-cooked rather than over-cooked as the final step involves placing the prawns into the sauce to stir fry around briefly again. Then prepare the sauce with the ingredients listed above - in Chinese home cooking, a lot of times, most ingredients are only given in approximates, apparently the mark of a good cook is that there is no need to measure ingredients, one just knows, now although I do operate the same way i.e. I just throw stuff into the pan depending on what feels right, I do think that would not be of much help to my readers. For this sauce, I would highly recommend you to start with a little of the seasonings and add on after tasting each time. And now saute the garlic, ginger and red peppers till fragrant - use medium to low heat. Now, pour in the previously prepared sauce and bring to a boil. 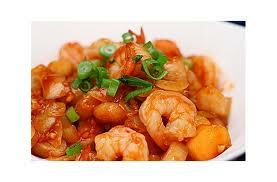 Quickly add in the previously fried prawns and stir around well to coat evenly. And serve it any normal rice or polao rice or any more. If you want try this home now.